The ESO Annual Report 2016 is now available. 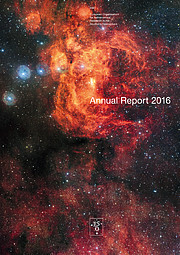 It presents an overview of ESO’s many activities throughout the year. Research highlights from ESO facilities, with the latest results across many fields of astronomy stretching from high-redshift galaxies to the discovery of an Earth-mass planet in the habitable zone around Proxima Centauri, the nearest star. A summary of operations at ESO’s observatories in Chile. The latest news from the Extremely Large Telescope (ELT) and Atacama Large Millimeter/submillimeter Array (ALMA) projects. News about ESO staff and buildings — including the ALMA Residencia and the ESO Supernova Planetarium & Visitor Centre. This product is available for sale in the ESOshop.